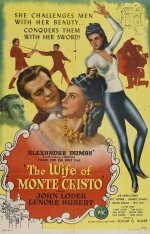 Edmund Dantes (Martin Kosleck), The Count of Monte Cristo, rides again in 1832, this time accompanied by (or stood in for) his countess wife, Haydee (Lenore Aubert. He is out for vengeance (using a mask and working as "The Avenger") against those who responsible for his imprisonment in the Chateau DIf, and justice for the people of Paris who are being mistreated by the crooked Prefect of Police and his henchmen associates, which leads Dantes engaging if a skirmish with the Gendarmerie, that leaves him incapacitated for a while, and Haydee takes his place as "The Avenger." There are some speckles to start with but after that this is a good transfer to dvd.